The Siebert Family: Growing Up. 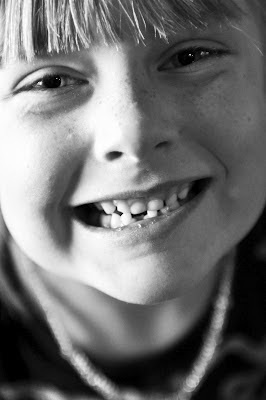 Guess who finally lost her first tooth? Ava said it took forever. 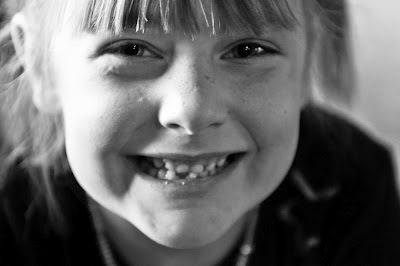 I said she was growing up too fast, so a slow wiggly tooth was ok.
She said the tooth fairy didn't come. Opppsss....I said, check back later. This morning she said mom she still didn't come. Oppsss AGAIN! Maybe i'll get it right next time. Maybe pregnant tooth fairies have memory problems too!! We are Collin, Andrea, Ava, Marin & Malacai Siebert! Thanks for taking time out of your day to see what we're up to! Spend a little. Save alot. A blog about discovering the little things that make this life wonderful as I deal with Down Syndrome, Farm Life, and raising 3 wonderful Kids! | Wife & Mommy trying to remember the little things that make this life wonderful! It's Hann 'ah-clock! | Is it that time again? this is me and this is my life.